Size (Large) 1 Panel 39x55 - 100x140 cm. THIS IS GENUINE ORIGINAL POSTER. Photography is exactly the article you will receive. VISIT THE STORE AND ALL CATEGORIES. If you would prefer Payments through Bank Transfer, you will be provided with Bank Coordinates. Always read carefully the description where details of the condition of the article can be given, since these are very delicate materials. Movie material Original part of a large private collection. Movies Poster Animation Posters Events Banner pvc Art Music Documentary Saghe Anime Manga Events. 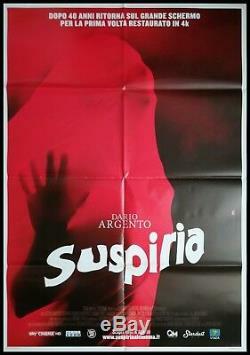 The item "SUSPIRIA Original Movie Poster 39x55 2Sh Italian Horror DARIO ARGENTO" is in sale since Friday, July 6, 2018. This item is in the category "Entertainment Memorabilia\Movie Memorabilia\Posters\Originals-International\2000-Now".zone" and is located in Cremona.